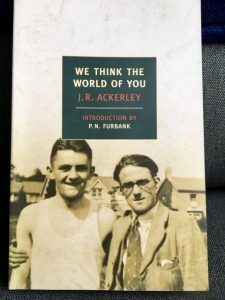 This entry was posted in English Literature and tagged Animals in literature, J.R. Ackerley, NYRB Classics, We Think the World of You by Simon Lavery. Bookmark the permalink. 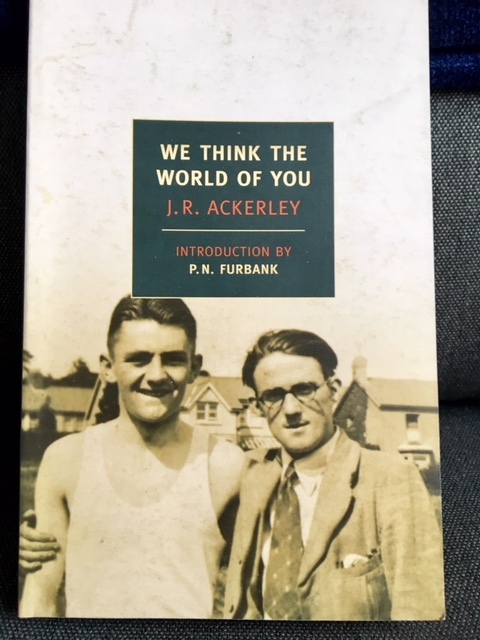 I’m wondering if there’s a sub-text here: a story published in 1960 with a couple of gays as lead characters – that would be very unusual for its time, wouldn’t it? It would have invited disapproval too, I’d guess, and so I wonder if the love for the dog is a way of saying, hey, look, he might be a kind of cliché gay man having a fraught relationship with someone of a lower class, but at heart, he’s just a human being like any other straight person, just looking for love. Being kind to dogs subverts the disapproval because anyone who likes dogs gets public approval? Good point, Lisa. Although there’s an autobiographical element in the story, JRA said himself it was a fairytale. Evie’s role does seem symbolic, maybe of Frank’s conflicted view of rivals, or women. It was pretty daring to have a homosexual relationship portrayed, yet none of the other characters seems to care about that, they’re all fixated on their own selfish needs, or their desires for another character. Even Evie. My book discussion group in Washington DC took on this novel about a year ago. We noted that it was published in 1960 and seemed to take place even earlier; I think post-war rationing was still in effect. I remember near the book’s end when Frank discusses a fading spinster cousin whom he, though carelessness, reduces to financial ruin (he was too busy tending to Evie.) I just can’t see it as life-affirming as you say. One can argue that people are supposed to take care of themselves, but Frank was tacitly the man or head of the family and the status of unmarried women as dependent may have lingered. (These are people born–when?) Maybe North Americans are not the best judges of this book. . Rationing ended in Britain in 1954, so those long queues people faced to buy meat and other provisions were still a trial when the action in the novel is set, you’re quite right. I can see your point about Frank; I found him pretty obnoxious for most of the novel. But there was just a glimmer of hope for him towards the end – though he did behave badly with the cousin. But I did see some sort of slight revelation in him. Maybe ‘life affirming’ is too strong; Frank isn’t really redeemed at the end – he’s still selfish. Now that I’ve had more time to reflect, I think my first instincts were perhaps right after all; it isn’t too rewarding a novel. I think your group’s N. American judgement was therefore pretty sound. thanks for dropping by and taking the trouble to comment – I value your interest and thoughts.